Micro-perforated bread bags are the ideal choice for packaging artisan and crusty bread. Our MPF1016 bag measures 10" x 16" and is designed to keep your bread fresh. Pin-size holes allow moisture to escape, allowing your bread to stay crisp. Bags are made with high clarity BOPP and have 60 holes per square inch. FDA approved. Our clear micro-perforated bread bags are perfect for packaging artisan bread. The MPF1016 bag measures 10" x 16" and is perfect for keeping crusty bread fresh and crisp. This bag is designed with 60 holes per square inch. 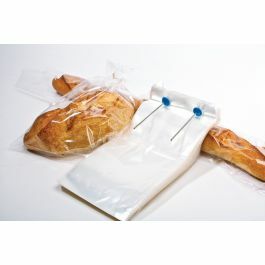 The pin-size holes allow the excess moisture in the bag to escape and release the delicious scent of freshly baked bread. Your bread stays crisp on the outside and soft in the center. Micro-perforated bags also work well for keeping produce fresh. These clear bread bags are made from high clarity BOPP for an exceptional presentation. Bags are unperforated at the top and bottom for added strength and durability. Wicketed. Close with twist ties. Food safe. Outer Dimensions: 10" x 16"
The primary use is for packaging artisan or crusty bread; micro-perforated bags also work well for holding produce.